Buddy finished his career ranked second at Oklahoma University in scoring with 2,291 points and as the Big 12’s all-time leading scorer. He became just the second player in Big 12 history to win conference player of the year twice. He ranks first in OU history in 3-pointers made (349) and attempted (894) and finished regular season conference play with 1,202 career points, the most all-time by any Big 12 player. At the end of his college career, he finished ranked third in Big 12 history in both field goals made (783) and 3-pointers made (349). Buddy set a conference record for most 30-point games with 14, including 12 during his senior season boasting six career double-doubles. Hield started every game for Oklahoma in his final three seasons (105 total) and played in 132 total contests in his career. 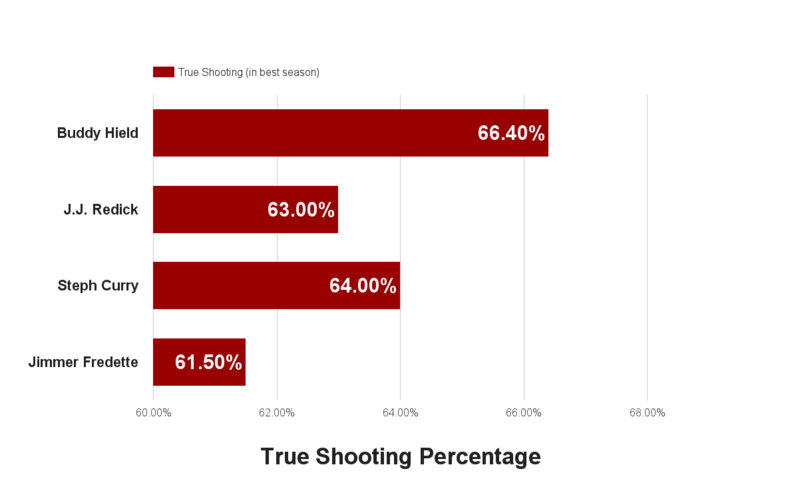 Buddy Hield has been mentioned as one of the most dynamic collegiate shooters in NCAA History. He has been compared to the likes of Steph Curry. His 127 made shots from three-point range led college basketball during the regular season. He’s also one of the most efficient shooters in country from behind the arc. He has improved his three-point percentage since 23.8% as a freshman to 46.4% as a senior. There have been players who have hit more threes than Hield did in his final season, but never someone who led the country in threes while still being so efficient.